Amphetamines are a class of compounds that are abused in many regions of the world, including the United States, Australasia, and Europe. Synthetic amphetamine compounds commonly are produced in clandestine laboratories and vary in purity and potency. Other potentials for amphetamine abuse include prescription medications often used for attention deficit disorder and various over-the-counter diet pills. Clinical effects of amphetamine abuse are significant and commonly observed in emergency departments (EDs). Patients may present with a range of psychiatric and medical problems, including agitation, psychosis, seizures, and potentially life-threatening cardiac dysrhythmias; see Presentation, Workup, and Treatment. See also Methamphetamine Toxicity and MDMA Toxicity. Amphetamines are a group of structurally related compounds that produce central nervous system (CNS) and peripheral nervous system (PNS) stimulation. The phenylethylamine structure of amphetamines (see the image below) is similar to catecholaminergic, dopaminergic, and serotonergic agonists (biogenic amines), which may explain their actions. The degree to which an amphetamine can stimulate the receptors of these biogenic amines depends on the chemical substituents on the amphetamine molecule; thus, the clinical presentation depends on the type of amphetamine used. 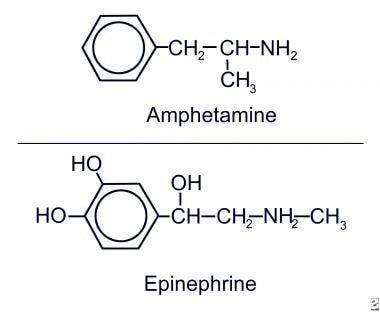 For example, methamphetamine lacks much of the peripheral stimulant properties of amphetamine while still offering euphoric and hallucinogenic properties. These actions are similar to those of cocaine; however, while effects of cocaine last for 10-20 minutes, duration of amphetamine action is much longer—as long as 10-12 hours. The routes of amphetamine administration may be oral (ingestion), inhalation (smoke), or injection (intravenous). Oral use is associated with an approximate 1-hour lag time before onset of symptoms, whereas inhaled and intravenous methods yield effects within a few minutes. Peak plasma concentrations occur in 5 minutes with intravenous use, 30 minutes with nasal or intramuscular use, and 2-3 hours postingestion. Amphetamine compounds cause a general efflux of biogenic amines from neuronal synaptic terminals (indirect sympathomimetics). They inhibit specific transporters responsible for reuptake of biogenic amines from the synaptic nerve ending and presynaptic vesicles. Amphetamines also inhibit monoamine oxidase, which degrades biogenic amine neurotransmitters intracellularly. The net effect is an increase of neurotransmitter release into the synapse. Physiological adaptation occurs through receptor or coupling down-regulation; this tolerance and an accompanying psychological tolerance  can lead to escalating use of the drug and increased toxicity. Long-term use can lead to a depletion of biogenic amine stores and a paradoxical reverse effect of the drug—a wash out. Elevated catecholamine levels usually lead to a state of increased arousal and decreased fatigue. Increased dopamine levels at synapses in the CNS may be responsible for movement disorders  , schizophrenia, and euphoria. Serotonergic signals may play a role in the hallucinogenic and anorexic  aspects of these drugs. Other serotonergic and dopaminergic effects may include resetting the thermal regulatory circuits upward in the hypothalamus and causing hyperthermia. The hyperthermia produced by amphetamines is similar to that of the serotonin syndrome. Laboratory studies reveal that amphetamines interfere with the normal control of the neurohumoral (hypothalamopituitary) axis, affecting secretion of such factors as adrenocorticotropic hormone (ACTH). Amphetamines may alter other neural functions such as complex behavioral and learning patternings; this may be important for understanding effects of amphetamine use during pregnancy. Animal studies indicate that amphetamines interact with N-methyl-D-aspartate (NMDA) receptors on serotonergic neurons, leading to neuronal destruction. This interaction may contribute to seizure activity. In vitro, amphetamines have been found to stimulate regulatory molecules, such as the oncogenes c-fos and ras and cyclic adenosine monophosphate (cAMP) response element binding (CREB) protein. These proteins are responsible for signaling long-term changes at the transcriptional level. Accurate estimation of illicit amphetamine use is difficult. An estimated 13 million Americans use these compounds without medical supervision. Random toxicologic screens performed in the ED indicate amphetamine presence in about 2% of patients. According to National Institute on Drug Abuse estimates for 2017, 3.5% of 8th graders, 5.6% of 10th graders, and 5.9% of 12th graders had used amphetamines during the past year. Self-reporting among college students indicates an approximate 4% prevalence. An aged-matched survey of fourth-year medical students revealed that about 1.2% use amphetamines. It is unclear how many of these uses are of amphetamine-containing prescriptions for attention deficit disorder (ADD) or attention deficit hyperactivity disorder (ADHD). Habitual amphetamine use produces toxic psychosis resembling paranoid schizophrenia. Hallucinations, delusions, and bizarre violent behavior are common. In a few patients, amphetamine use produces long-term paranoid schizophrenia; whether this results from unmasking underlying disease is unclear. Severe psychological depression and prolonged sleep follow chronic use and binges. Amphetamine use characteristically occurs among single white men aged 20-35 years who are typically unemployed. Data from rural populations reveal that whites use amphetamines significantly more than blacks . However, amphetamine use is becoming more common among women and other ethnic groups. Carvalho M, Carmo H, Costa VM, Capela JP, Pontes H, Remião F, et al. Toxicity of amphetamines: an update. Arch Toxicol. 2012 Mar 6. [Medline]. White TL, Lott DC, de Wit H. Personality and the subjective effects of acute amphetamine in healthy volunteers. Neuropsychopharmacology. 2006 May. 31(5):1064-74. [Medline]. Murray JB. Psychophysiological aspects of amphetamine-methamphetamine abuse. J Psychol. 1998 Mar. 132(2):227-37. [Medline]. Karch S. The problem of methamphetamine toxicity. West J Med. 1999 Apr. 170(4):232. [Medline]. Downes MA, Whyte IM. Amphetamine-induced movement disorder. Emerg Med Australas. 2005 Jun. 17(3):277-80. [Medline]. Wappler F, Roewer N, Kochling A, Scholz J, Loscher W, Steinfath M. Effects of the serotonin2 receptor agonist DOI on skeletal muscle specimens from malignant hyperthermia-susceptible patients. Anesthesiology. 1996 Jun. 84(6):1280-7. [Medline]. Richards CF, Clark RF, Holbrook T, Hoyt DB. The effect of cocaine and amphetamines on vital signs in trauma patients. J Emerg Med. 1995 Jan-Feb. 13(1):59-63. [Medline]. Uvnas-Moberg K, Hillegaart V, Alster P, Ahlenius S. Effects of 5-HT agonists, selective for different receptor subtypes, on oxytocin, CCK, gastrin and somatostatin plasma levels in the rat. Neuropharmacology. 1996. 35(11):1635-40. [Medline]. Jacobs W. Fatal amphetamine-associated cardiotoxicity and its medicolegal implications. Am J Forensic Med Pathol. 2006 Jun. 27(2):156-60. [Medline]. Kueh SA, Gabriel RS, Lund M, Sutton T, Bradley J, Kerr AJ, et al. Clinical Characteristics and Outcomes of Patients with Amphetamine-associated Cardiomyopathy in South Auckland, New Zealand. Heart Lung Circ. 2016 Apr 20. [Medline]. Chin KM, Channick RN, Rubin LJ. Is methamphetamine use associated with idiopathic pulmonary arterial hypertension?. Chest. 2006 Dec. 130(6):1657-63. [Medline]. Monitoring the Future Study: Trends in Prevalence of Various Drugs. National Institute on Drug Abuse. Available at https://www.drugabuse.gov/trends-statistics/monitoring-future/monitoring-future-study-trends-in-prevalence-various-drugs. Accessed: December 19, 2017. United Nations Office of Drugs and Crime. World Drug Report 2017. June 2017. Available at http://www.unodc.org/wdr2017/. van Wel JH, Rosiers JF, Van Hal G. Changes in Drug Use Among Belgian Higher Education Students: A Comparison Between 2005, 2009, and 2013. Subst Use Misuse. 2016 May 24. 1-7. [Medline]. Westover AN, Nakonezny PA, Haley RW. Acute myocardial infarction in young adults who abuse amphetamines. Drug Alcohol Depend. 2008 Jul 1. 96(1-2):49-56. [Medline]. [Full Text]. Bramness JG, Rognli EB. Psychosis induced by amphetamines. Curr Opin Psychiatry. 2016 Jul. 29 (4):236-241. [Medline]. Huang B, Dawson DA, Stinson FS, Hasin DS, Ruan WJ, Saha TD, et al. Prevalence, correlates, and comorbidity of nonmedical prescription drug use and drug use disorders in the United States: Results of the National Epidemiologic Survey on Alcohol and Related Conditions. J Clin Psychiatry. 2006 Jul. 67(7):1062-73. [Medline]. Borders TF, Booth BM, Han X, Wright P, Leukefeld C, Falck RS, et al. Longitudinal changes in methamphetamine and cocaine use in untreated rural stimulant users: racial differences and the impact of methamphetamine legislation. Addiction. 2008 May. 103(5):800-8. [Medline]. Justice AJ, De Wit H. Acute effects of d-amphetamine during the early and late follicular phases of the menstrual cycle in women. Pharmacol Biochem Behav. 2000 Jul. 66(3):509-15. [Medline]. Carvalho F, Remiao F, Soares ME, Catarino R, Queiroz G, Bastos ML. d-Amphetamine-induced hepatotoxicity: possible contribution of catecholamines and hyperthermia to the effect studied in isolated rat hepatocytes. Arch Toxicol. 1997. 71(7):429-36. [Medline]. Papaseit E, Moltó J, Muga R, Torrens M, de la Torre R, Farré M. Clinical Pharmacology of the Synthetic Cathinone Mephedrone. Curr Top Behav Neurosci. 2017. 32:313-331. [Medline]. Albertson TE, Chenoweth JA, Colby DK, Sutter ME. The Changing Drug Culture: Emerging Drugs of Abuse and Legal Highs. FP Essent. 2016 Feb. 441:18-24. [Medline]. Baumann MH, Solis E Jr, Watterson LR, Marusich JA, Fantegrossi WE, Wiley JL. Baths salts, spice, and related designer drugs: the science behind the headlines. J Neurosci. 2014 Nov 12. 34 (46):15150-8. [Medline]. [Full Text]. Rosenbaum CD, Carreiro SP, Babu KM. Here today, gone tomorrow…and back again? A review of herbal marijuana alternatives (K2, Spice), synthetic cathinones (bath salts), kratom, Salvia divinorum, methoxetamine, and piperazines. J Med Toxicol. 2012 Mar. 8 (1):15-32. [Medline]. [Full Text]. Prosser JM, Nelson LS. The toxicology of bath salts: a review of synthetic cathinones. J Med Toxicol. 2012 Mar. 8 (1):33-42. [Medline]. Gibbons S. 'Legal highs'--novel and emerging psychoactive drugs: a chemical overview for the toxicologist. Clin Toxicol (Phila). 2012 Jan. 50 (1):15-24. [Medline]. Begeman A, Franssen EJF. Lack of Detection of New Amphetamine-like Drugs using Conventional Urinary Immunoassays. Ther Drug Monit. 2017 Nov 29. 29 (2):179-81. [Medline]. [Guideline] Wright RS, Anderson JL. Adams CD. Guidelines for the Management of Patients with Unstable Angina/Non-ST-Elevation MyocardialInfarction. J Am Coll Cardiol. May 2011. 57:e215-367. Derlet RW, Albertson TE, Rice P. The effect of haloperidol in cocaine and amphetamine intoxication. J Emerg Med. 1989 Nov-Dec. 7(6):633-7. [Medline]. Plessinger MA. Prenatal exposure to amphetamines. Risks and adverse outcomes in pregnancy. Obstet Gynecol Clin North Am. 1998 Mar. 25(1):119-38. [Medline].